Wishing you favourite moments to treasure today! It's interesting that the majority of the things on your list are of little or no monetary value. Proving, I suppose, that it isn't money that makes us happy. What a good thing to do now and then, Brenda. And I like your friend Vee's suggestion of some sort of Word Art. Has me thinking now! What a wonderful idea, Vee... word art... I like it. This was such a lovely list to read. I especially liked all of the items related to reading and writing. The bowl full of colorful ribbons was an unexpected surprise. I don't think I've ever seen one before but can picture it vividly. I share so many of your favorites...we may be kindred spirits! Just reading this list makes me relax and smile. Just wonderful! I think this could easily be my list too! Well written! 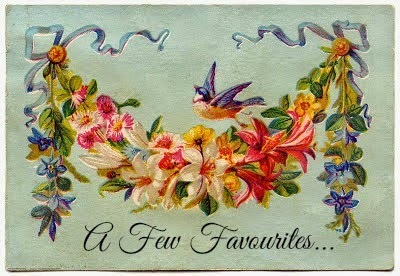 I love your list and your lovely blog. Hope you have a lovely weekend.